I am a Whole Foods Junkie. If I could add a bed and a tv, I would move in. There is something about the place that makes it just so inviting. The fruit always looks perfect, the meat always looks clean and the accessories that they have hanging on each aisle always get me! Its like the Nordstrom's of grocery stores, I just enjoy going. BUT, that being said, I always end up spending way too much money. I've heard people call it "Whole Paycheck" because, well, I guess its just a known fact that they are on the expensive side. But I like that my fruit and veggies don't look questionable, there are a lot more organic and natural options than most other grocery chain stores, or so it seems. They have a great vitamin, nutrition, and makeup section. The Whole Foods employees seem to be very friendly, and knowledgeable, for the most part. Then Mariano's came to our 'hood (in Bannockburn), and I have to say, its got a good feel to it as well. One thing it has that Whole Foods seems to lack, is a bigger eating area/cafeteria, and seems like it has many more options to choose from if you want to eat a meal there, or take something ready made, home. The fruit and veggies actually don't look so bad, and although I have yet to try getting my meat from there, it may be worth a shot. Their bakery is great... although I have had 2 separate issues getting birthday cakes there for both my children. Both times they lost my order (the first time they actually lost it twice) and the last time, they had to make my cupcake cake right there and then as I was on my way to the party for my son, and they completely let it go! BUT, the quality is good, and the baker makes a great cake, even customizes it, for much less than a bakery would charge. PLUS, they now have the service ClickList, where you can order your groceries online and pick them up at the curb (for a cost, of course). So after seeing how much of our money actually goes to groceries, I decided I may have to take Mariano's for a spin and see if it will actually save me that much more, vs going to my ever loving store, Whole Foods. 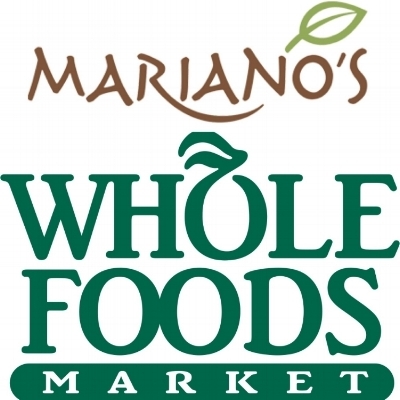 I'd love to hear your thoughts on Mariano's vs Whole Foods!